Learning to draw what you see is one of the biggest challenges in developing drawing skills. Basically, you are teaching yourself to see things in two-dimensions so you can easily translate it to a two-dimensional form (a sheet of paper.) If you close one eye and handicap your perception of depth, things appear more or less flat. This plus learning how to translate what you see into a grid-like reference allows you to accurately place objects and images on to paper or canvas. Hold a pencil vertically in front of an object. 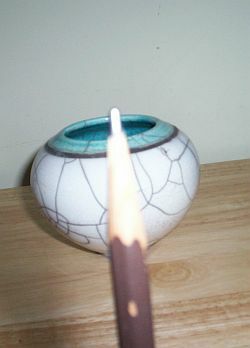 Place your thumb on the pencil to determine the length of the object. Remember the measurement. 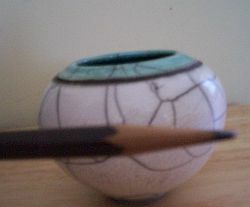 Hold the pencil horizontally and place your thumb on to measure the width of the object. Remember the measurement. What is the difference between the two settings? Let's say the vertical setting is longer than the horizontal. How much? This determines the size and proportion to the object you are looking at. Basically you are using the pencil as a grid to determine the size of the object in front of you. You can draw the basic shape of the object and verify its proportions this way. Set up two or three simple-shaped objects and try the pencil gauge method. These are important skills to drawing what you see whether it is a still life, a landscape, a portrait or a figure drawing. This grid method was developed during the Renaissance and was an important skill that enabled masters like DaVinci and Durer with to depict the proportion of objects accurately . Here is my video that demonstrates this method. Here are several videos I have created on shading still life objects. Hey lois I am a emerging artist here in sc I haven't had the opportunity to go to formal art schools I have been drawing all my life as far back as I can remember. I saw your free art classes online and book marked them and when I have more supplies am going back. when they found out I had not took art classes.......I've always wanted to just havent had the opportunitys . thank you so much. Hello Lois. Thanks for giving me the opportunity to learn hoy to draw and paint in diferentes styles and techniques. I just started and I've never had taken any classes til now with your tutorial. I really worldwide appreciate your comments about my still life exercise. I specially have problems with shading the table and painting the wood graining (as you can se in the picture) and also the table cloth. The melon sas difficult too, I feel something is missing there too . (Some things in the picture I didn't want them to apear in my painting) I'm starting to work with the landscape. As son as I have ir done I'll send you the picture. Best regards and thank you again. A drawing instructor once told me, "Work a little, you'll draw a little better than anyone else. Work a lot and you will really begin to draw!" And it was true. As I began to spend more time on my sketch book journal, my drawing in class improved. I began to practice drawing what I saw and wrestled with the voice in my head that kept telling me, "Hey, it's time for lunch! Let's take a break! You've been sweating over this thing for an hour. Give it a rest!" I learned to shut the dialogue off and taught myself to really see what I was drawing--so I could draw it. I learned pencil shading and expressive line with pen and ink. And you can, too. Knowing the skill is only a small part of learning to draw what you see...Spending the time to practice drawing and using the pencil gauge method will soon have its rewards. You will literally see, within weeks, your work vastly improve. My demo drawing of drapery. Here I emphasized seeing the folds of drapery as simple shapes and drawing them using basic lines and shading. I often tell beginning drawing students that being objective and not getting involved with detail is important in learning the basics. The detail will come later, first master the skills and techniques! Ultimately, drawing what you see is not drawing what everyone else sees as well. Although, if you draw a tree very accurately and everyone agrees that it is indeed a tree--even if you all can agree on the shape of the branches, the color of the leaves, the roughness of the bark, their interpretation of your drawing is different, No two people ever see the same thing because each brain, rich with original experiences and vision, is unique. And so the artist's work, in the end, is his/her own interpretation as well, whether the work is realistic or abstract. Picasso once said, "In art we express our conception of what is not visible in nature."